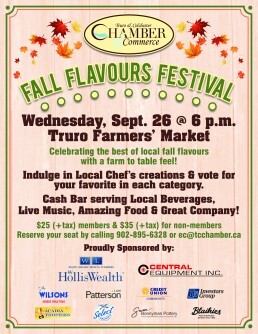 Join us as we celebrate Fall with our Annual Fall Flavours Festival on September 26th. From 6-9pm at the Truro Farmers Market we will celebrate local with over 12 chefs using as many local ingredients to create delicious appetizers, main courses, and desserts for our guests to sample. We will also have local beer, wine, and spirit samples as well as live music, cash bar, and LOTS of prizes! Guests will vote on their favourite dishes from each category and our top chefs will receive a prize. We will also be featuring a Guest Chef!